Some people find the notion of booking holiday accommodation a little daunting. I love it. There is nothing that gets me more excited about a holiday than researching not only the destination but also where I will be staying. In addition to researching accommodation in Seminyak for my holiday to Bali a couple of months ago, I always find it beneficial asking a friends for their recommendations as well. Anyone who travels to Bali is spoilt for choice with accommodation across all budgets. Whether you’re a backpacker looking for super cheap accommodation, a family wanting to stay in a resort that ‘has it all’ or a group of friends looking to stay in a private villa with a pool, Bali has it sorted. The Hotel For my first trip to Bali I stayed in Seminyak at the Royal Beach Hotel. 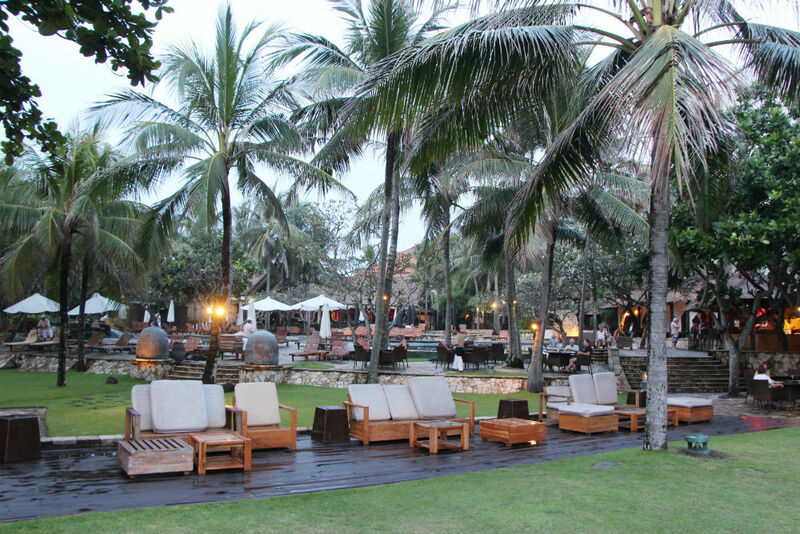 Situated on Seminyak Beach, the Royal Beach Hotel is set amongst 4.5 hectares of tropical gardens. Along with 128 rooms and 17 secluded villas each boasting a private pool, the resort offers two stunning pools, one right on the beach and another tucked into the garden area which is where I did most of my sun worshipping and swimming, a gym, convenience store, and ballroom. If you do choose to stay at the resort whilst in Seminyak, I recommend the daily breakfast buffet – the choice was outstanding as was sampling new and different exotic fruits every morning. Surrounded by luscious gardens brimming with florals and palm trees, it’s very easy to fit into the island life as the resort effortlessly allows guests to completely immerse themselves in the exotic atmosphere of Bali. The hotel is also walking distance from the main streets of Seminyak which is home to some of the trendiest bars, restaurants and shops in Bali. The Rooms I was lucky to stay in one of the Grande Deluxe rooms which included a huge bathroom, a king size bed, LCD television, DVD player, in-room afety deposit box, hair dryer, internet connection, refrigerator, mini bar, tea and coffee making facilities, private balcony, long sofa and coffee table, telephone, bathtub and separate shower room. I definitely wasn’t slumming it, and upon walking into my room for the first time the smell of fresh frangipani’s blew my senses away – my favourite summer flower. Leaving no stone unturned when it comes to service, each guest also receives a fresh lime and coconut juice on arrival, and a welcome basket complete with a sandalwood fan in the guest rooms, essential for the humidity outside. The rooms are also serviced twice a day; once in the morning and again in the afternoon when they turn down your beds. The Restaurants There are four restaurants (and one bar) to choose from at the Royal Beach Hotel including Japanese, Balinese, French and Mediterranean cuisine. They all provide a relaxing setting however you get the distinct feeling the Royal Beach Hotel doesn’t want you to leave the resort which might be ok for some, but not for me. LADIES LISTEN UP, MC IVER'S BATHS IN SYDNEY IS JUST FOR YOU!